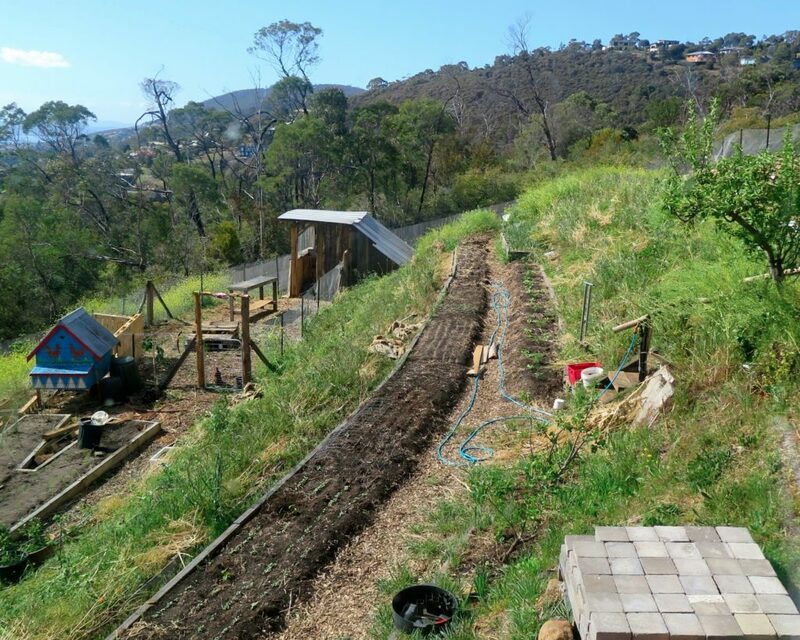 In mid 2016 we bought the neighbouring patch of weedy/bush land we’d been drooling over for 4 years; and at the beginning of 2017, we started shaping it to include a driveway and more garden/animal space. 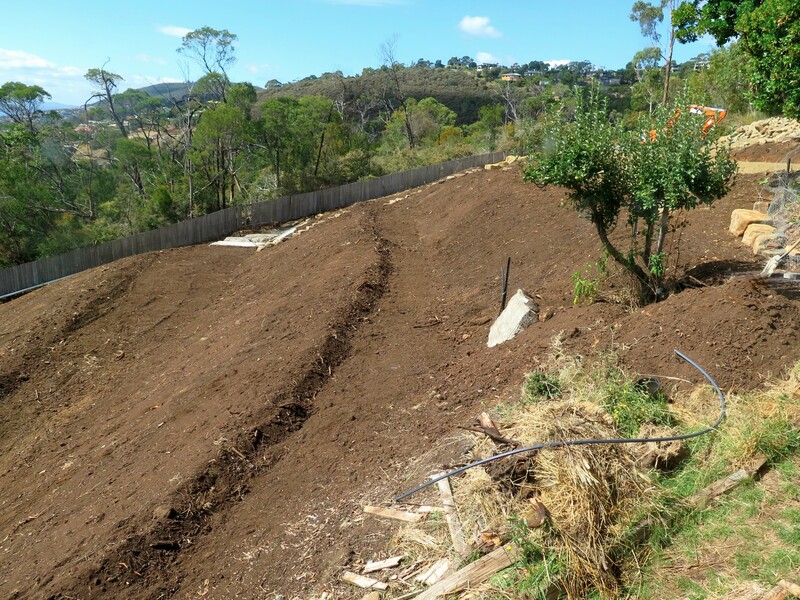 We’d been drooling over this steep landscape as up until early 2017 the only way into our property was by walking up a very steep, 100m rocky staircase from the road. We had always wanted to buy the neighbouring land to improve access – it just took 4 years to get it done. 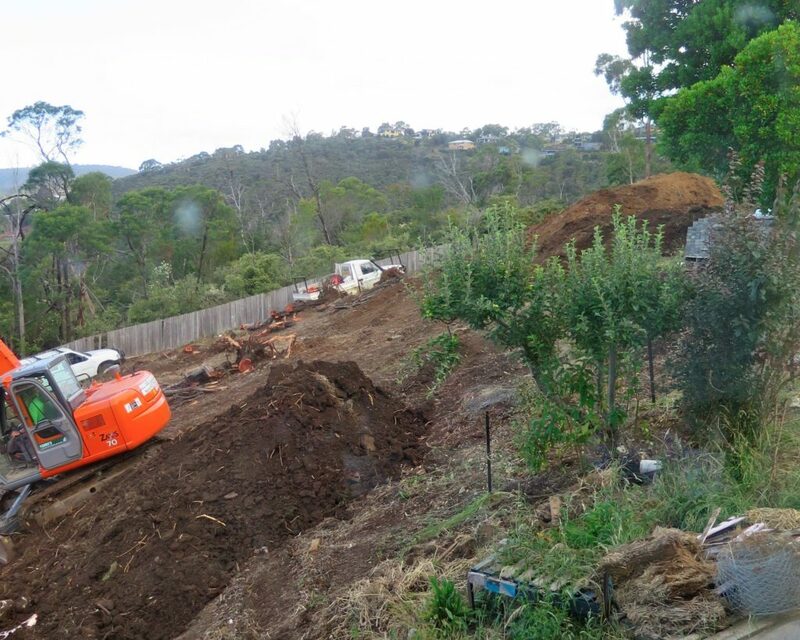 When we started earthworks, the view from our house overlooking the new land looked like this. 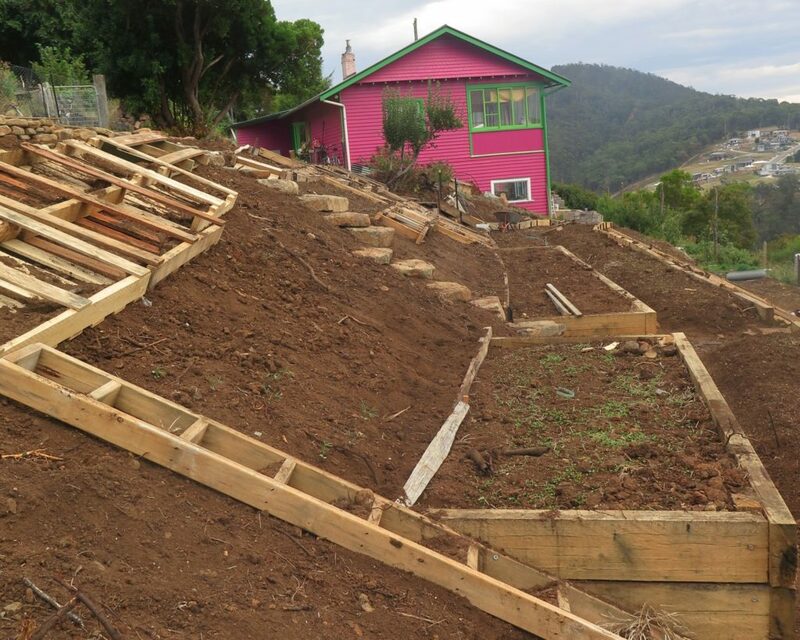 As our land is very steep, we knew straight away that we wanted to terrace it, inline with what we had already done in our existing garden. 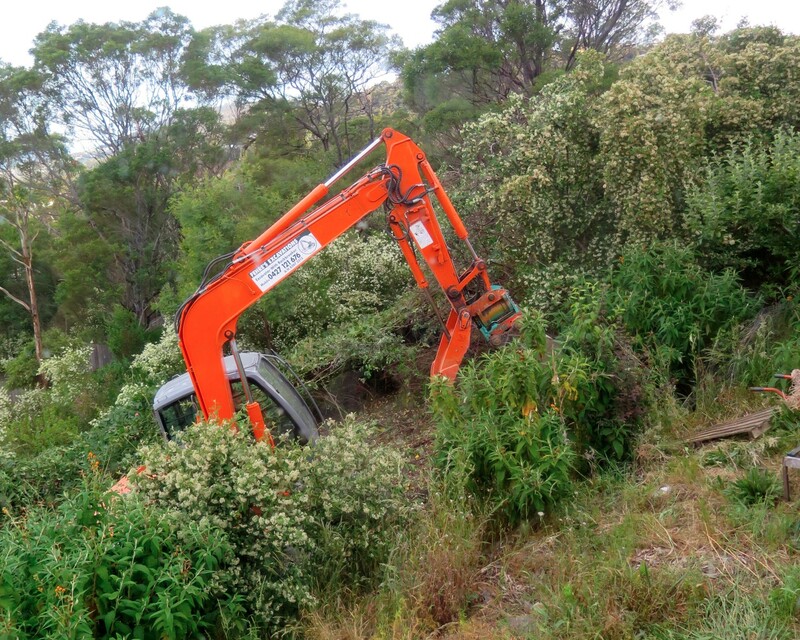 So the whole site was cleared, with the green waste taken to the local tip site where the Hobart Council composts it in large hot piles and sells it back to the community. 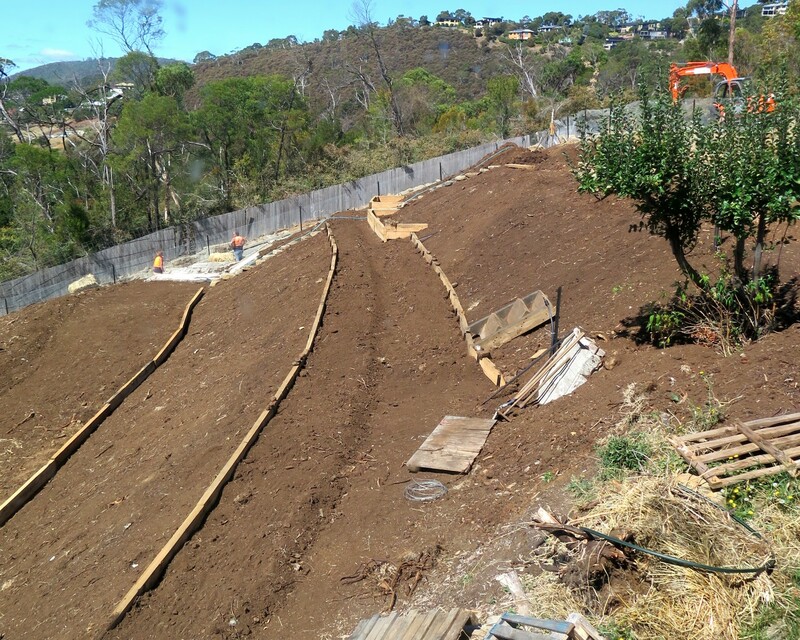 While we would have LOVED more flat ground, we couldn’t afford to build retaining walls everywhere. Instead, we designed large earth banks with an angle of approximately 30 degrees. 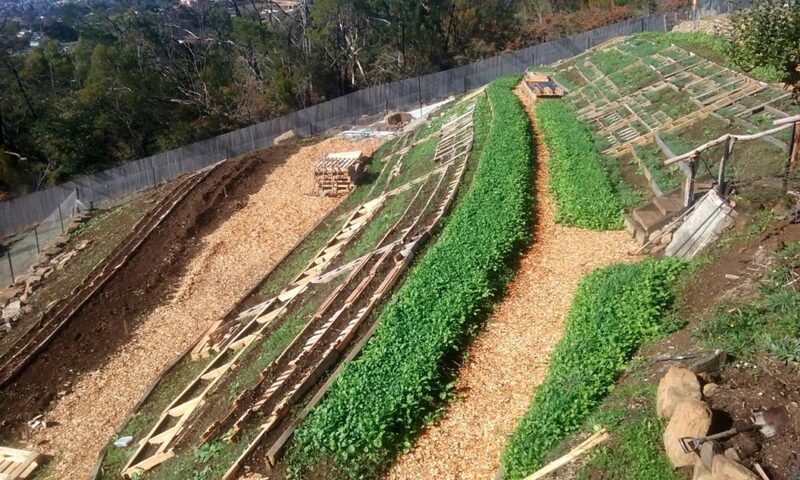 Like our current garden, we planned on using these as edible forest gardens and the flat terraces for annuals crops and animals. 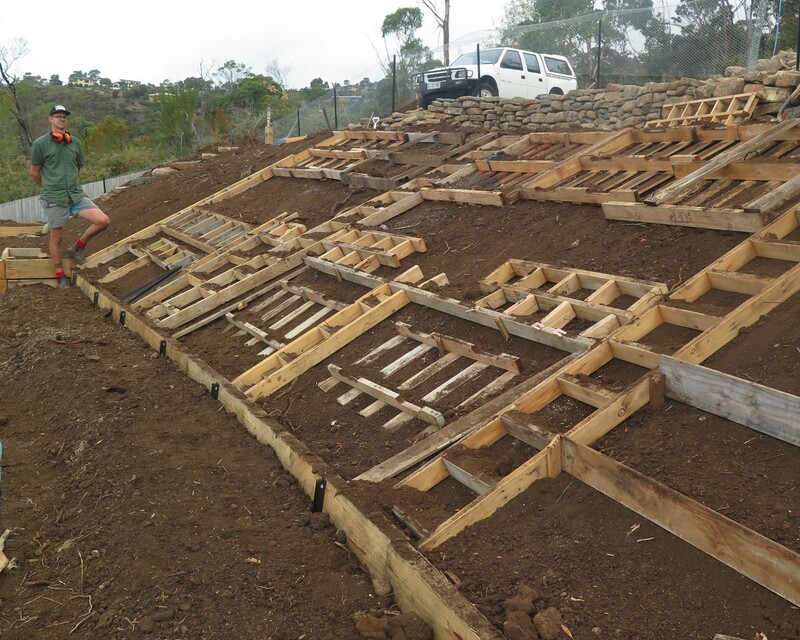 …And a hell-of-a-lot of heat treated pallets to stabilise the earth banks. 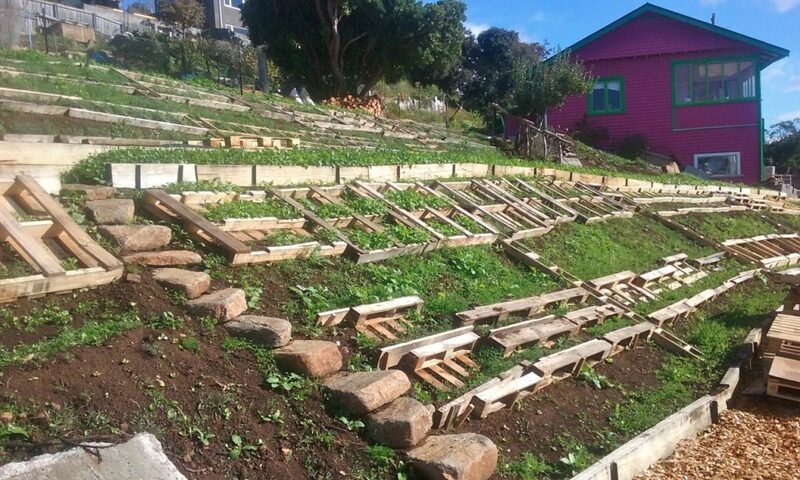 This techniques has been a real game changer for us in steep slope gardening, as the pallets provide lots of ledges to plant into, making it easier for plants to get established. It’s also easier to irrigate and passively harvest rain, as water is slowed down (a little bit), instead of quickly rushing down each bank. Around this time, Anton’s day (Gote) sailed his boat down from NSW, parked in the local bay and would come up every day to build a rock wall, dig holes and just be his marvellous, eccentric Swedish self. 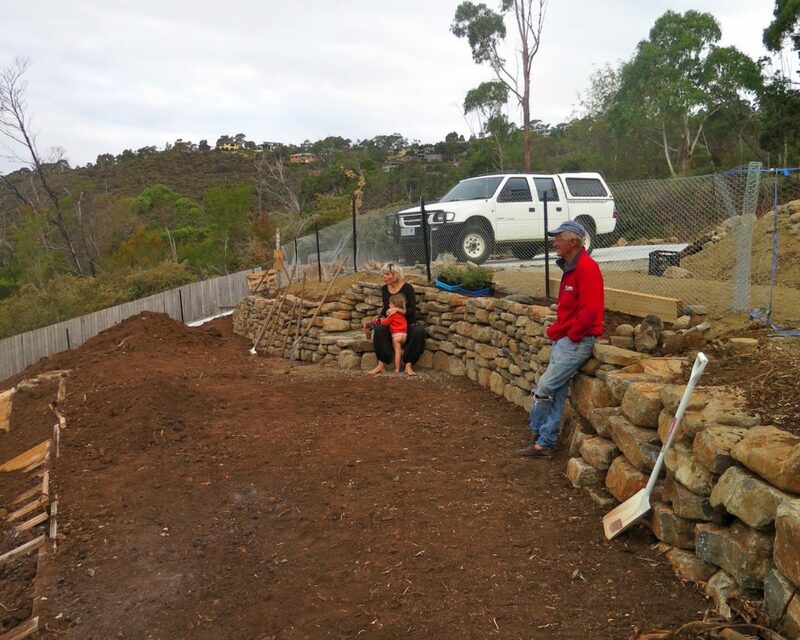 All the rock came from onsite and was simply rearranged to build our one and only retaining wall :-). Gote on the far right reclining on his rock wall. We then very quickly broadcast a mix of green manure seeds directly on the banks in late Autumn to get things growing. This included red clover, mustard, lupins and rye grass. A couple of times throughout Winter, we’d slash the green manures down – delaying them going to flower/seed so we could get more root growth and more benefits for the soil. 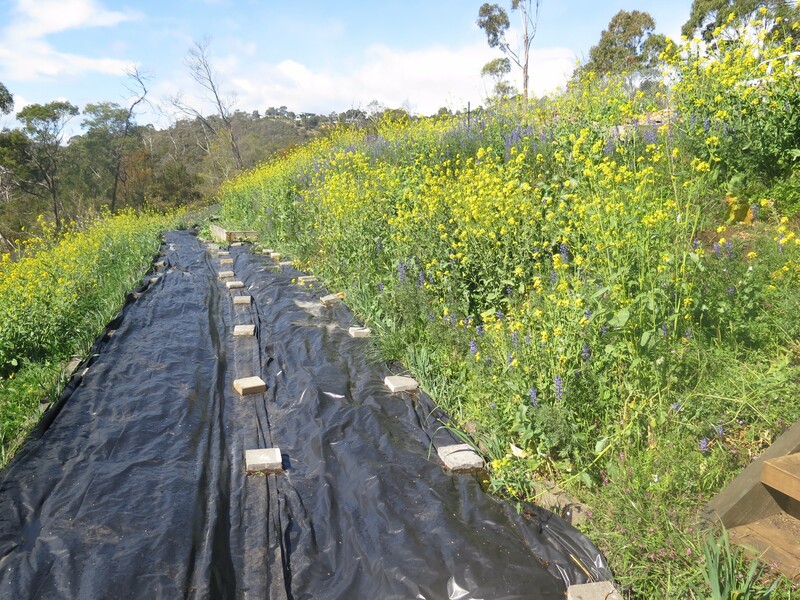 In early Spring, we let the banks go to flower for which the bees thanked us (they loooooved it in there) and covered the future annual beds in non-toxic, UV stablised black plastic to break down the green manure crops without having to dig *at all*. The black plastic was left on there for around 6 weeks in which time all the green growth died back and the soil biology ate it up. Today (Oct 31 2017), the view from our window onto our new patch of land looks like the photo below….. 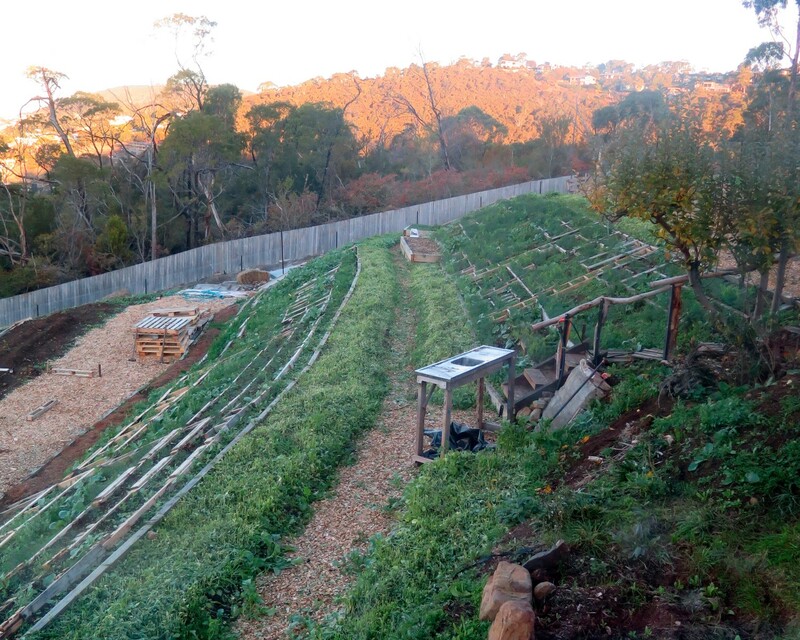 There are thousands of annual veggie plants on the flat terrace you can see and another above this (out of shot). We have two toggenburg goats, Gerty and Jilly Love Face who moved in just over 2 weeks ago. Gerty provides 1.5L – 2L of milk every morning and Jilly Love Face (who’s 3 weeks old) provides enormous entertainment. 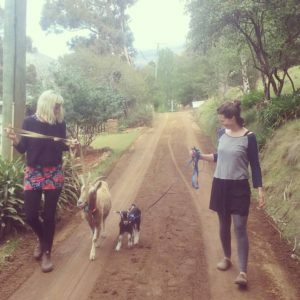 The chook house has been moved to be with the goat run and we’ve planted 20 hazelnuts and 10 mixed trees into the earth banks. Currently the earth banks still have remnants of Winter’s green manure crops. We’ve started cutting and dropping them in place as mulch and will be planting floral and edible shrubs, plus perennial herbaceous layers into the bank over the next year to form an edible forest garden. Baby hazelnut trees popping up amongst the green manures. 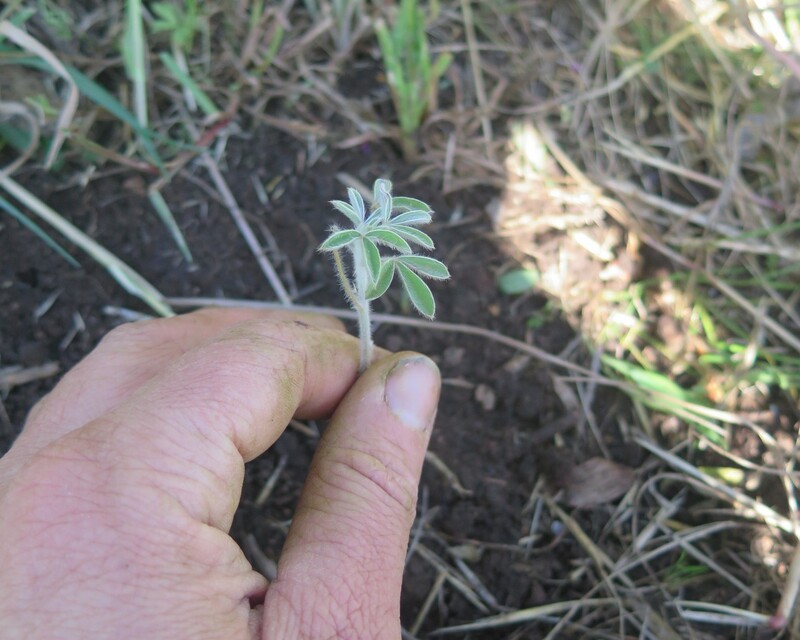 In between each nut and fruit tree, we transplanted tagasaste (tree lucerne) seedlings that self-seed in the local bush/weedy land behind our property. 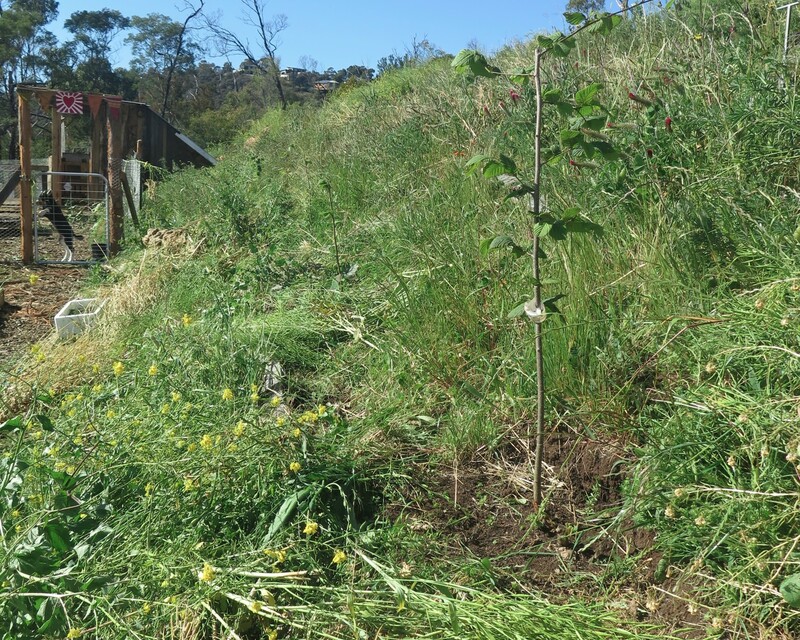 These nitrogen-fixing small trees are quick growers and will provide benefits to the soil and fodder for our chooks and goats. Eventually they’ll be chopped down once the nut and fruit trees mature and need more space. 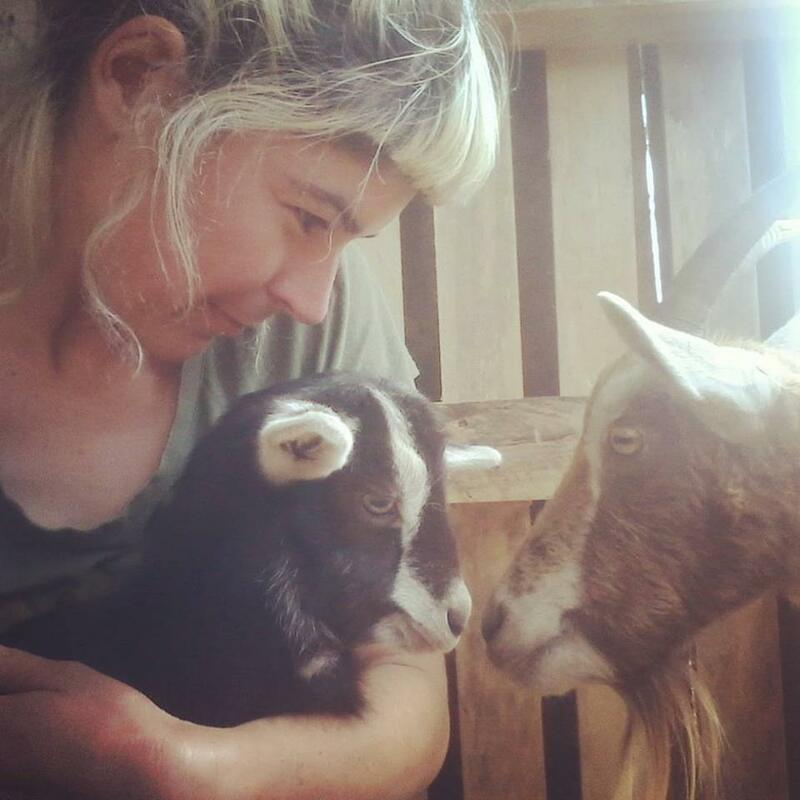 And the goats are truly glorious. You can see them below on one of their daily walks and amongst the many daily cuddles we have. Obviously there’s still a long way to go with our property, and more time required before we see mature trees, but today (or this morning at least) I’m just pausing and reflecting on the past 10 months and *really* enjoying the change of view from our window.